We provide high quality web content writing services, which convinces and engages your Readers. All contents will be written uniquely after conducting in-depth studies and market researchers relates to the topic. Website content and structure overlap. Static content such as domain, title and menus have a lot to do with the structure of the website, while the pages and posts fall under the commandment of SEO friendly web content. 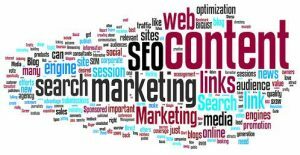 The ‘content’ commandment of search engine optimization dictates that we focus on our targeted key words and phrases and not stray too far from them too often. This is common sense, just as the title and subtitle of a book should indicate something of its contents, and the inside cover should elaborate even more. Readers will hesitate buying a book whose topic is unclear, and so will visitors with websites. Our Organic SEO company helps keep its clients focused on their targeted content so that their visitors read rather than browse. The more focused a site will be in terms of its contents, the more legitimately will it rank for the target key word or phrase of which it speaks.